The construction company currently finishing off the Shard building in London, which will be the UK’s tallest skyscraper, recently had to call the council to remove a squatter from the 72nd floor: a young fox. He was surviving on scraps left by builders. After a check-up at the Riverside Animal Centre, the fox has been released on the streets of Bermondsey, having shown the type of curiosity we associate with cats. Are foxes dangerous to cats? On a recent BBC wildlife podcast, fox expert Professor Steve Harris, Bristol University stated that the average urban fox will kill a cat every 6 years, and that some 500 cats live in every fox territory. So the risk is tiny. This is very rare; a survey in northwest Bristol, where foxes were particularly common, showed that they killed 0.7% of the cats each year and these were predominantly young kittens. This means your cat is far more likely to be run over, stray or die from a variety of other causes. Foxes are only a little bit bigger than a cat (males average about 5.5 kilograms) and are equipped with a set of sharp teeth. Cats have an equally sharp set of teeth, plus some pretty unpleasant sharp claws. If a fox tackles a cat, it risks severe injuries and that is the last thing it wants. Every night a single fox will meet many, perhaps dozens of cats and most encounters are either indifferent or amicable. Cats and foxes will usually ignore each other. However, some cats are aggressive animals and will go for a fox, sometimes to drive it away from their garden or food bowl. Usually a fox will flee but if this is not practical and particularly if it is cornered, it may defend itself against the cat. Then both animals may be injured. Finally, although foxes live in family groups and meet up periodically to play or socialise, they hunt alone. So stories of “packs of foxes” roaming the streets killing pet cats are totally fictitious. Above photo from Wiki Commons of fox and pet rabbit by Oosoom. An alleged fox attack on twin baby girls, while they slept upstairs in their east London home, has made front page news and provoked considerable debate. As people swap their fox experiences, an interesting picture emerges of fox behaviour in an urban setting. They smell as strong as a skunk in close quarters, and although it is theoretically possible to have their scent glands removed, this is not very healthy and will not eliminate the smell of their urine, which is very powerful. Foxes need a huge amount of space in which to run. Foxes love to dig, and can easily dig out of a yard or through a sofa. Foxes are at high risk to carry rabies. In many areas, there is no approved rabies vaccine for foxes; even if you have papers proving your fox has been vaccinated, some states will still have it destroyed and tested if it bites someone. Because foxes are at high risk, you MUST get it vaccinated. This can prove very difficult. Veterinarians need a special license to treat wildlife, which many don’t have, because it’s a high-risk, low-reward proposition. Lastly, it is very likely that a fox you own as a pet will be very unhappy. Many wild animals become depressed when removed from their natural habitat, and foxes are subject to depression as much as any other animal. Foxes are now more common in urban areas than the countryside, according to an RSPB survey about wildlife in Britain’s gardens: 38% of urban nature-watchers had seen one compared to 23% in rural areas. Large zones of the countryside have become inhospitable to wildlife, with intensive mono-crops and no hedgerows or woods to provide cover. So it’s no wonder that urban areas, full of potential hiding places and easy pickings in rubbish bins, are becoming increasingly attractive habitats for foxes. Fox culling is unlikely to have any effect on the urban fox population. If a fox is removed from a food rich area, its territories will simply be seized by another. The most humane and long-term solution to deterring foxes is to remove or prevent access to things that are attracting them to the area, like food and shelter. 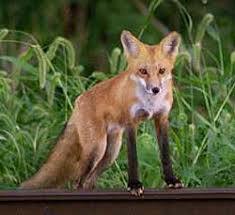 Foxes can also be deterred by barriers such as fencing or prickly plants and chemical repellents. The ever entertaining Irelandbyways mentions here in one of its routes the remarkable mausoleum of fox hunter Robert Watson (1822 – 1908), Master of the Meath Hunt. 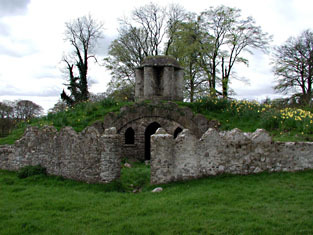 He was so convinced that he would be re-incarnated as a fox that he had a temple-crowned mausoleum built in the form of a foxes’ earth, impenetrable to foxhounds and with tapered escape tunnels. In his last will and testament, Watson stipulated a ban on fox-hunting, in perpetuity, on his Larchill estate. Believing what he did, one wonders why he didn’t ban it before.